We’ll begin the day aboard the Hotaluna, a space age ferry designed by famed animator Leiji Matsumoto, as we cruise down the Sumida River to get a good look at the city we’ll be calling home. When we get back onto land, you have a choice: visit the brand new Gundam Statue in Odaiba, along with the new Gundam center there – or head over to see the future of tech at Tokyo’s technology museum, Miraikan! Day 4: fans or food? We begin our day in the anime fan mecca of Akihabara! Shop for the latest in anime merchandise, explore state-of-the-art electronics boutiques, and join us for a visit to a local maid café (included in the tour cost)! Not feeling like shopping much? No worries – we’ll also have a group going to the “kitchen neighborhood” of Kappabashi, where the plastic food looks real and Japan’s chefs go to pick up their tools of the trade. Regardless of which you pick, we’ll all regroup later to try our hand at making Japan’s famed soba noodles with a pro chef. That night, you’ll be treated to a complimentary dinner at a restaurant with some very enthusiastic baseball fans! After a stop at the city’s famous Meiji Jingu Shrine join us in Harajuku, Tokyo’s center of all that is hip. Shop for kitschy souvenirs, fashions, or just wander the aisles of one of Japan’s largest “100 Yen” stores searching for fun stuff to bring home. Not interested in shopping? Join the guides for a trip to the nearby Shinjuku Gyoen gardens. That night, take it easy, or join your companions for a special dinner cruise on the waters of Tokyo Bay! After storing our larger bags at the hotel, we bid farewell to Tokyo and head to Kyoto! Prepare to see the city at its most vibrant – it’s festival time! For starters, we hit the the shrine gate tunnels of the fox-themed Fushimi Inari shrine. After exploring and taking tons of photos, we’ll make our way through the streets of Kyoto to Yasaka Shrine and the main procession of Japan’s largest festival, the Gion Matsuri! We begin with a visit to Kyoto’s Nanzenji Temple, where you’ll be able to walk among zen rock gardens and venture inside (yes, INSIDE) the temple’s massive gate. Then we head to the Higashiyama area of the city to see the famous Kiyomizu Temple. Shop for traditional souvenirs and local cuisine, or join the other girls in town to dress up at a Maiko courtesan for a photoshoot and walk among the traditional shopping spots. In the evening, we hit the big city! It’s off to Osaka’s Umeda area for some shopping, dessert-ing, and more! Today is a free day! Your guides will be on hand the night before to help you plan your day out on the town. If you like, join an optional trip to Universal Studios Japan, or stick with your guide to check out the Yayoi Kusama art installations on the gorgeous Naoshima Island. That night, we board a train to relocate to the Kanazawa area in preparation for the following day. Get ready for a full day in Kanazawa, considered the jewel of Japan’s Hokuriku Region, to experience the world-renowned Kenrokuen gardens in the city center. That’s not all though; we’ll also see the city’s Chaya District, a well-preserved collection of old tea houses and villas that will transport you into the storied history of the region. After a visit to a famed Ninja Temple on the west side, we’ll check in at our hot spring (onsen) resort for a multi-course dinner prepared by our gracious hosts. We’ve been doing a lot of exploring, so today is a chance to relax and recharge at our resort! 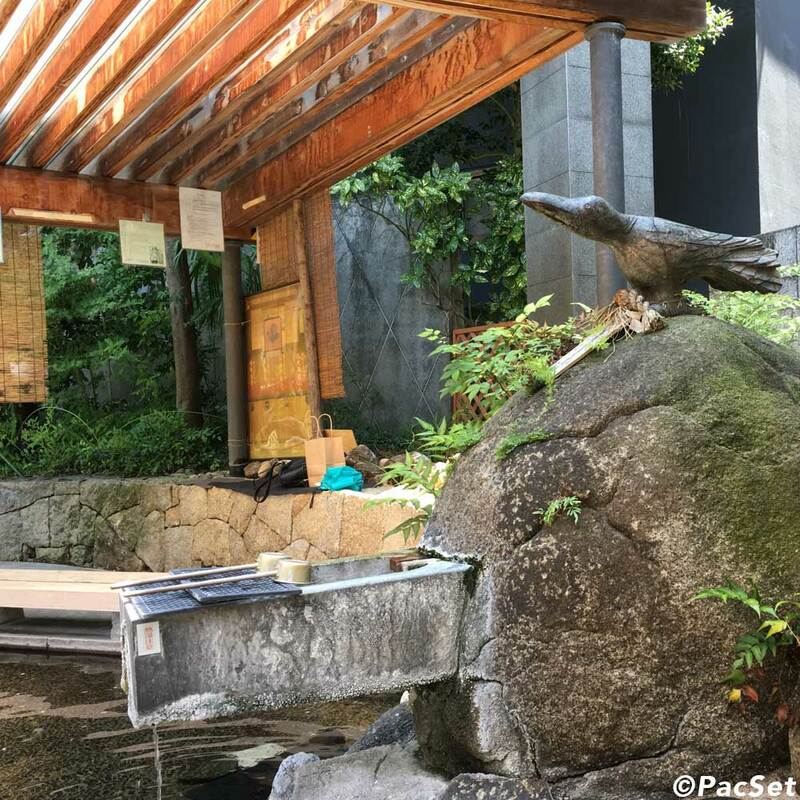 Enjoy a fancy breakfast and dinner prepared with local ingredients, and relax in the soothing hot spring waters locals have loved for more than a thousand years. If you want, join your guides for an optional stroll into town, or join us for the fourth annual PacSet race down the onsen waterslide! Today, we check out of our resort and board the brand new Hokuriku Shinkansen line for the trip back to Tokyo. Once we arrive, you can choose to take it easy or join the guides for a trip to the shopping malls and glamour of the Ikebukuro neighborhood. In the evening, we’ll head out to take in the amazing Adachi Ward fireworks! Day 12: Free Day in Tokyo! Today is a free day! Your guides will be on hand the night before to help you navigate Tokyo and plan your day so you can check out something on your wish-list –- or return to a place you wanted to see more of.